Keep Moving Forward. Don’t Look Back. 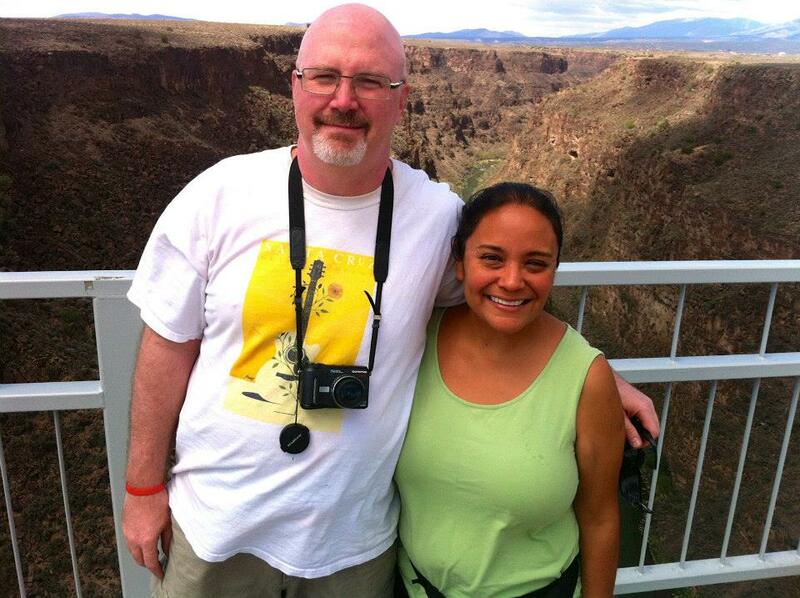 For ten years, Dennise and I have lived with the memory of one of the most terrifying journeys we ever took. It was a pre-GPS navigation world. It was a pre-digital-photography world too. But since we have both now, we recreated this journey the other day, such that we now have pictures to tell the story. 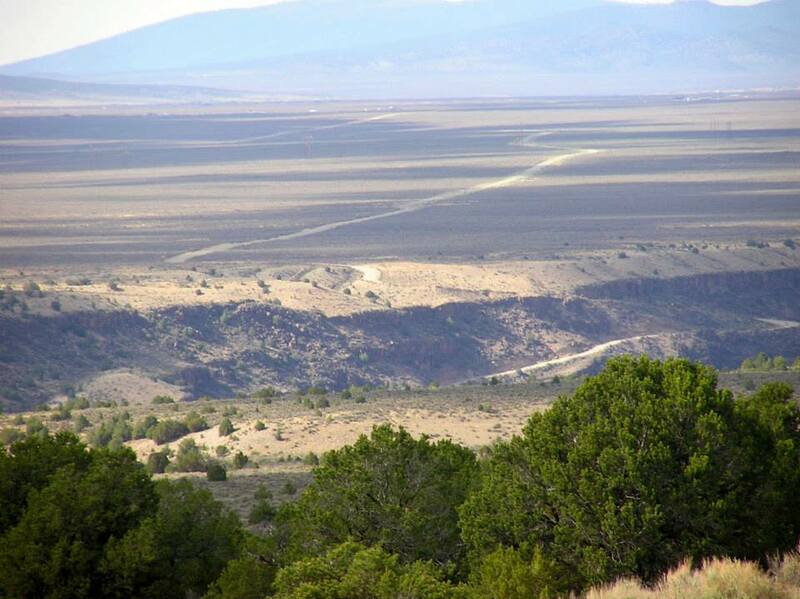 One day of that trip, we drove south toward Santa Fe, across and into the mountains. 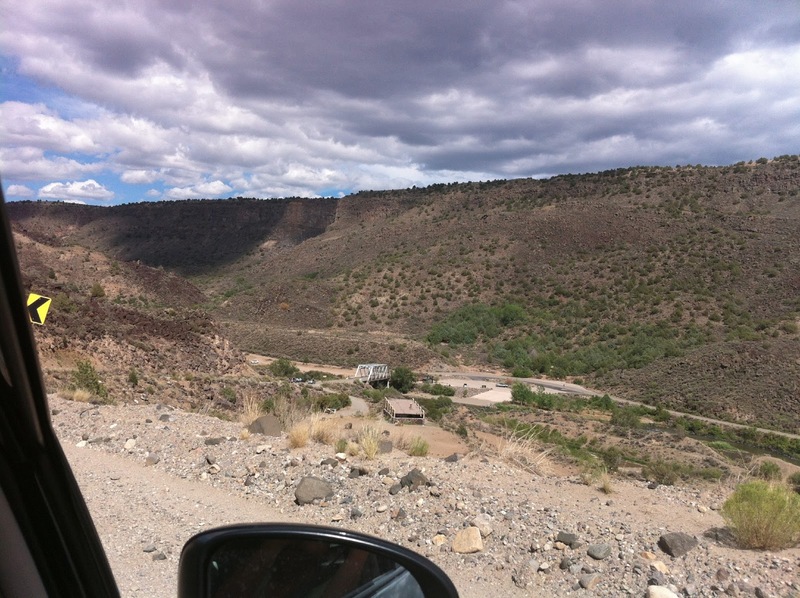 Were we going to Chimayo? Was it the same day we took this trip? The point is, we no longer remember, and it really doesn’t matter. What matters is that it had been a long day, it was getting late, and we found ourselves between Taos and Santa Fe, with the sudden need to back to Ojo quickly. If you don’t know the area, geographically, here’s a cheat-sheet map. 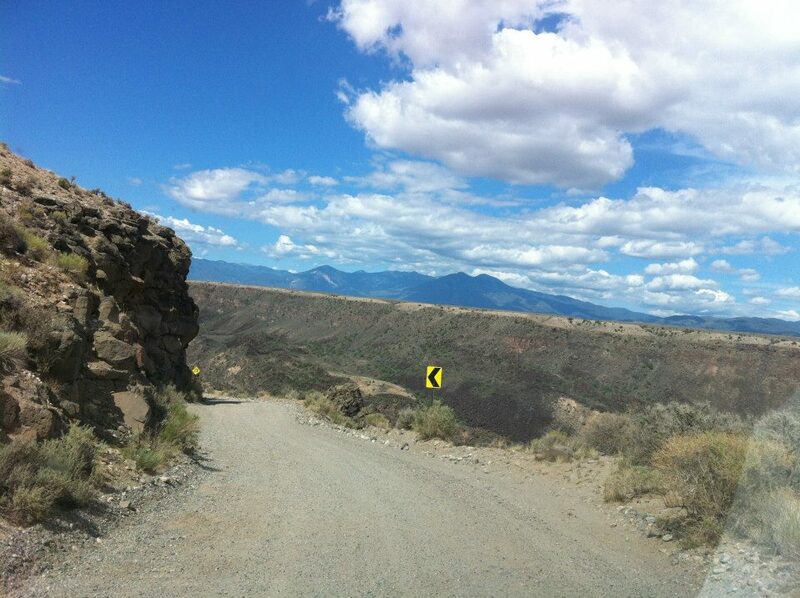 When this story begins, I believe we were somewhere near Ranchos De Taos, perhaps fresh from a day in the mountains. 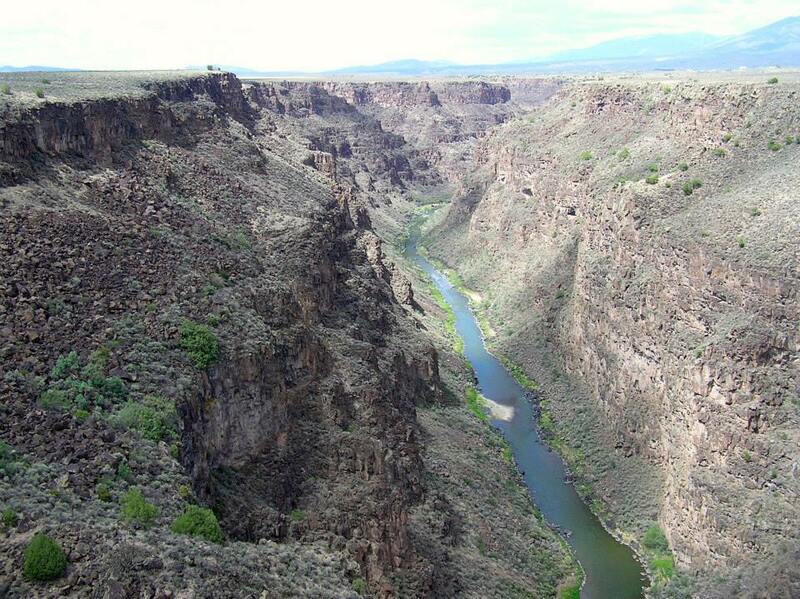 The basic problem in getting back to Ojo from there is the Rio Grande Gorge. It’s huge. Really massive. I mean, sure, the Grand Canyon dwarfs it. But that’s hardly fair. The Grand Canyon dwarfs everything. See? It’s huge. Here’s another map that gives you a sense of the gorge, and the geographic challenge it holds. 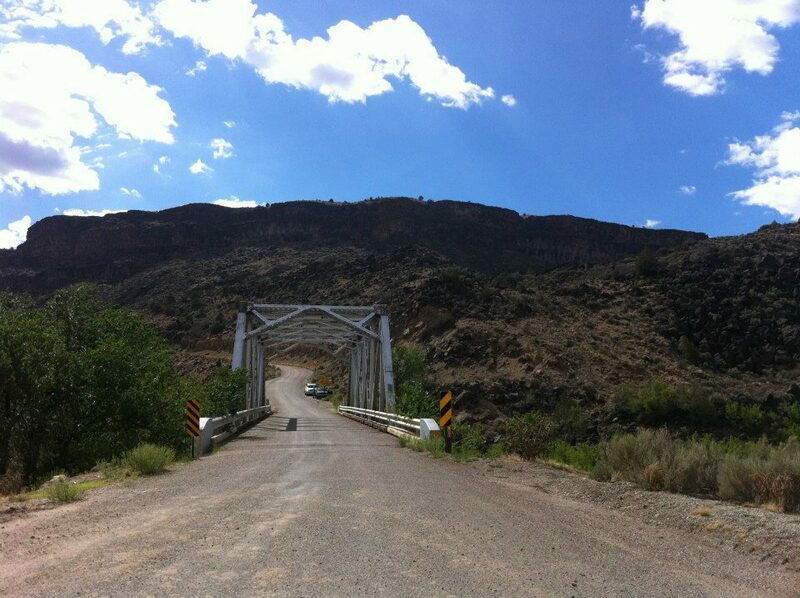 b) Head North, go all the way through Taos, and cross at the Rio Grande Gorge Bridge, which we’d never done before. “Option A” was not appealing. We’d been there and done that, and it seemed like a long drive. Again, we were tired and in a hurry. But the map indicated that “Option B” would also be quite a drive. Again, remember this is pre-GPS. Today, any decent GPS –like either the one in our Prius and on our iPhone– will tell you that “Option B” is not that long, really. 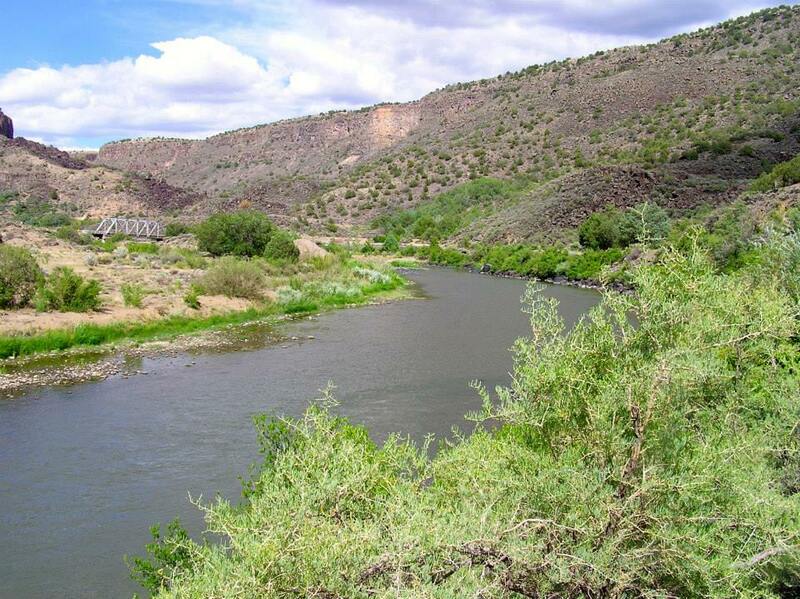 Turns out you don’t have to drive all that way out to Tres Piedras (20-30 miles out of the way) There are state roads, just across the Gorge Bridge, that are quite lovely and make for a short, beautiful trip back to Ojo. But on that day, ten years ago, it looked like a 30-mile trek out of the way. And, as I can’t emphasize enough, for some forgotten reason we were tired and in a hurry. But hark! Low and behold, the paper maps indicate a “Plan C!” The maps indicate what appears to be a direct path across the gorge on State Hwy 570. (You can see it clearly indicated on this map). Hard to tell what kind of bridge it would be. But it showed to come out on the other side, near Carson. And that would clearly shave 20-30 miles off any other route. So, we set out to find Hwy 570. We got to the turn, headed, past a few houses that were popping up alongside it. But, eventually the road narrowed down. And then, a strange thing: Boulders in the middle of the road. Big enough to slow you down. Small enough to drive around. Oh well. Keep moving forward. Don’t look back. Remember, the road is clearly indicated to be a good one on the map. 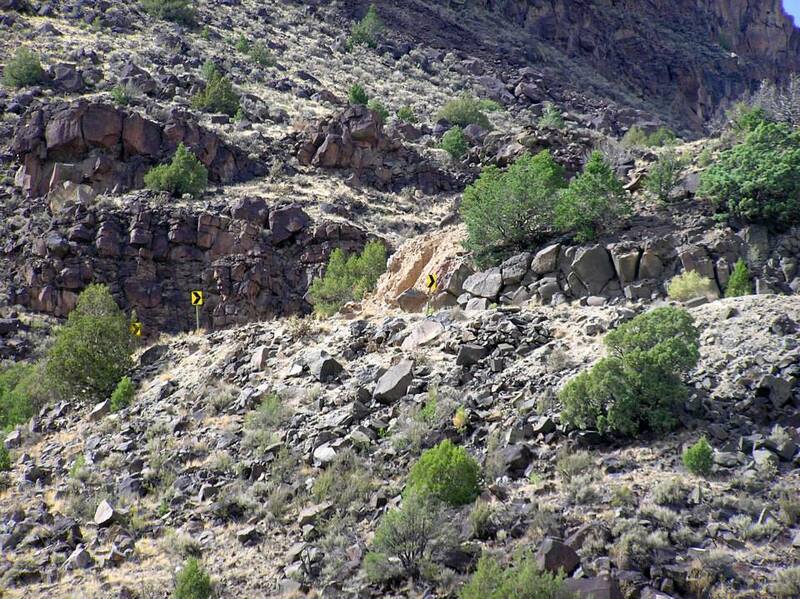 It seems to snake along the canyon, and in some unclear way come out on the other side. So, we just drove around the boulders. Turns out, this is why not. Lucky for us, the boulders meant we weren’t going too fast when we came to this point; where the road, quite literally, just falls into the gorge below. I mean, one second it’s a perfectly good road. The next, it’s all Roadrunner and Wylie E. Coyote. We slowly backed away from the edge, turned around and drove out. 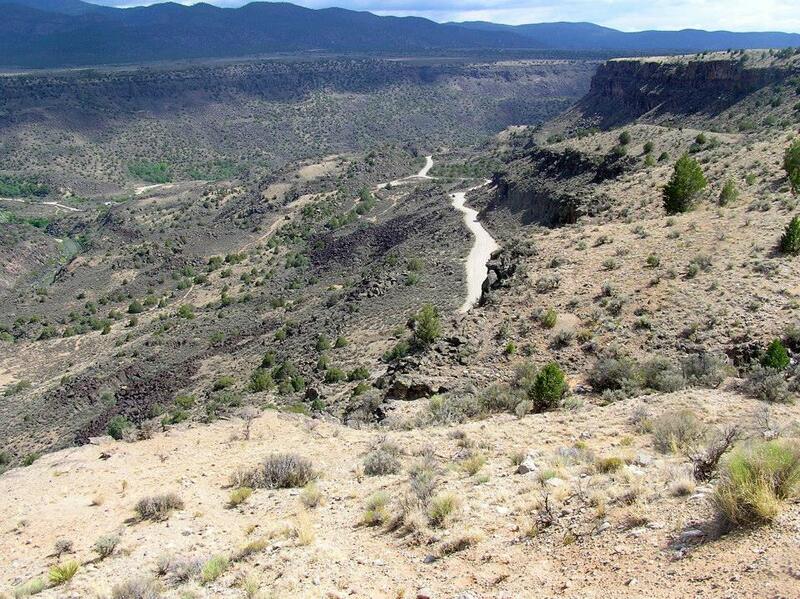 Now, you might think this close encounter would convince us to give up the quest for the short cut and head to the Rio Grande Gorge Bridge. The short-cut hadn’t worked. Now, we were later than ever! Time to raise the stakes, and double down. So we checked the map again, and found that there might actually be another place, farther down Hwy 68, where Hwy 570 loop back out of the canyon. If true, it was down near the town of Pilar. It showed there a state park there too. Which gave us some confidence. I mean, if there’s a state park and all, how bad can the road be? We headed down there, and turned in. We found that the road was actually quite lovely. 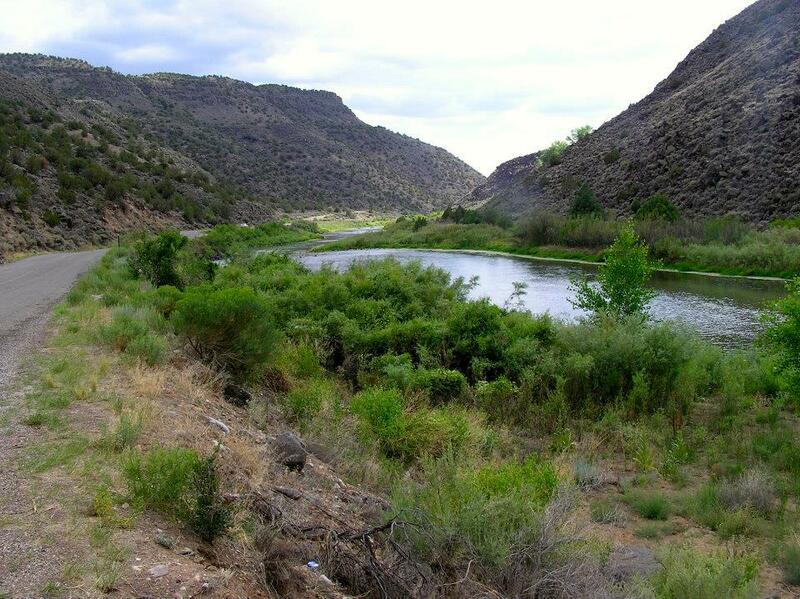 It gently slopes down the eastern side of the gorge, and within a few hundred yards, you’re looking at this…. It’s just an incredibly beautiful scene down there, in the bottom of the gorge, tracking along the path of the river. Reminded me very much of the Big Thompson Canyon in Colorado. I mean, with each passing minute the Sun’s getting lower. If this doesn’t work, we’re screwed time-wise. Eventually, you get to this bridge and river crossing. So, by now, we’re even farther behind. 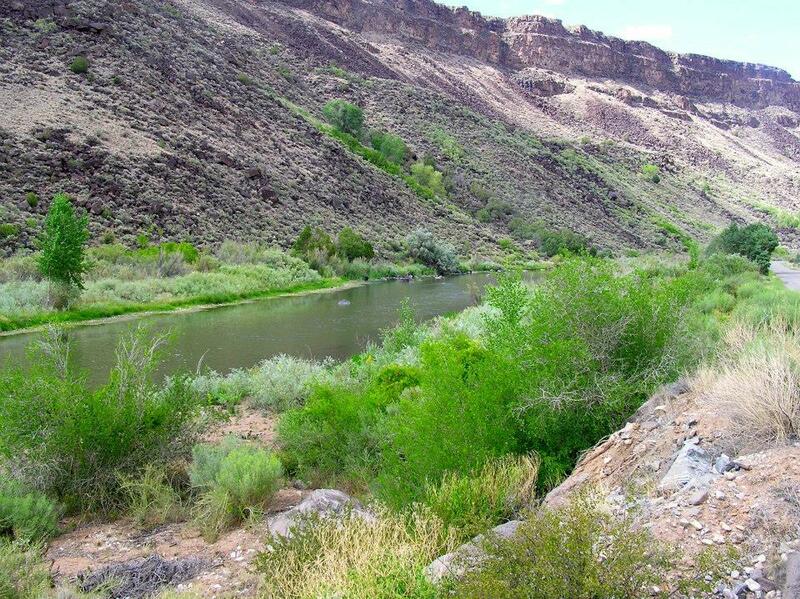 We’ve snaked along this river for about ten miles. And this bridge clearly leads somewhere. It seems to go up the other side of the gorge. But, is this the actual crossing and road we’ve been looking for? What if it’s not? What if it just…ends up there, somewhere? Remember…we’ve just encountered what we thought was the real road. And it got all “Thelma and Louise” on us. 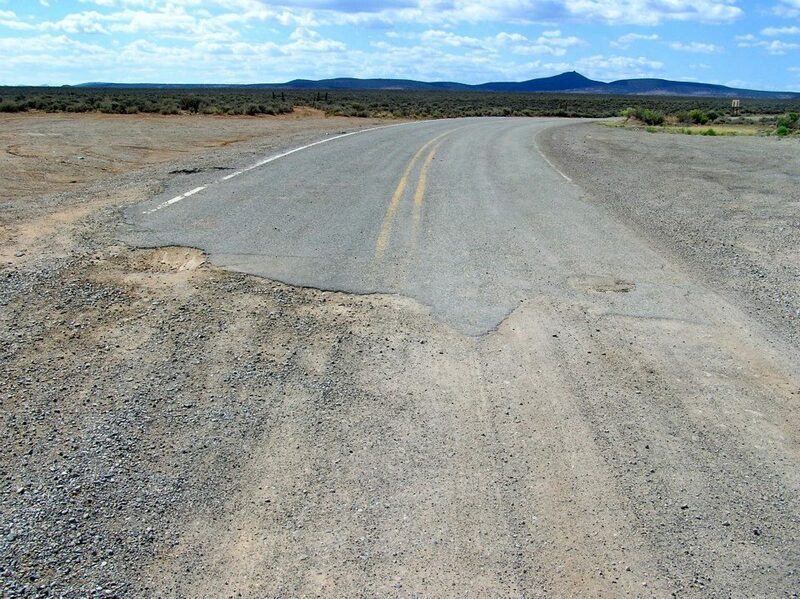 What if this road does the same? 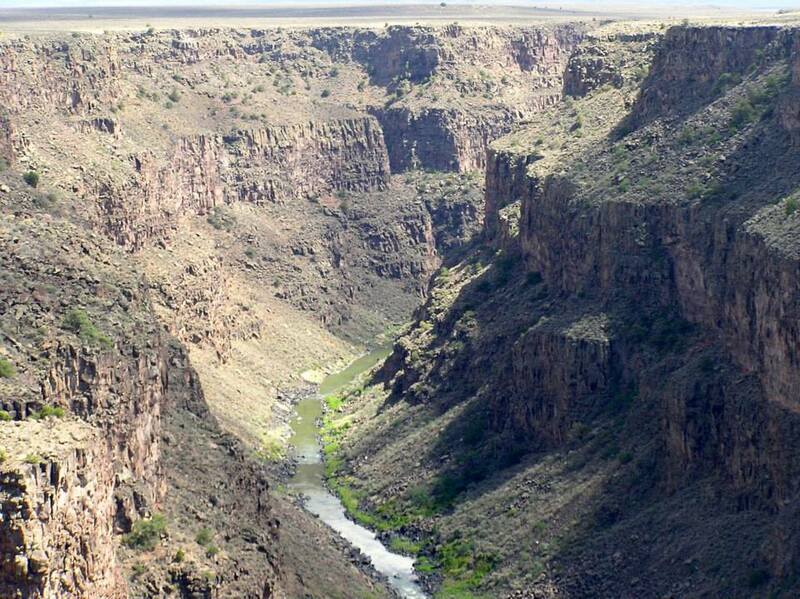 What if we start up the other side, and it drops off into nothing on the side of the canyon? Just beyond the bridge, the road turns to gravel and starts up the side. Gentle at first. But almost immediately, there’s a hairpin turn. And within a a few hundred years, this suddenly seemed like a horrible mistake. This pictures aren’t gonna do it justice, but here’s it is. It didn’t feel wide enough to turn around safely and go back. So, about a quarter of the way up, we decided we’ve got to keep going. We can’t turn around now…literally we can’t turn around now….even if we don’t know where this is going. When Dennise and I get into full “freak out” mode, it’s usually accompanied by stone silence on her part and nervous chatter on mine. She really doesn’t like heights anyway. (Although our trips to Colorado after this have helped…). So, being on the side of a gorge was not, shall we say, fun. I kept trying to take her mind off it by focusing on the positive. Higher and higher the road goes. Where the hell is it going? Will it drop off into nothing at any moment? 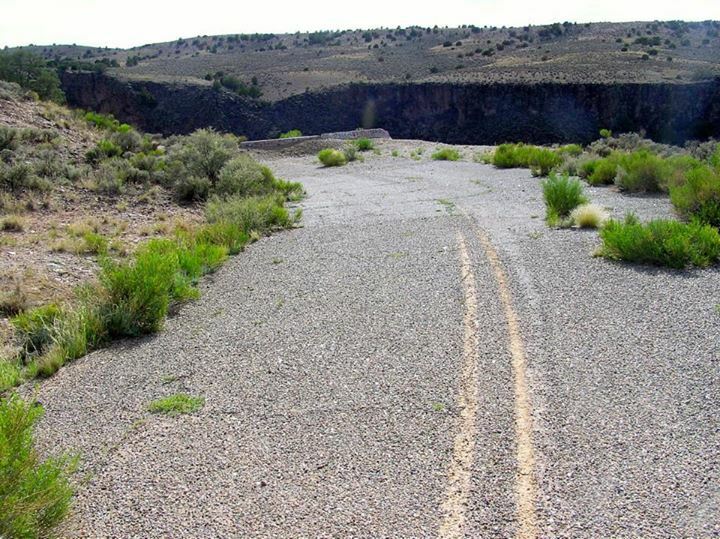 Will our friends and loved ones hear the story of our tiny rent car splotch on the canyon floor? The mind does start to race. Dennise says more things that I will not repeat here. I move from my usual space-filling-chatter, and join her sheer silence. That’s when you know it’s really bad. Neither of us have the feeling that this is gonna end well. Behind you, sheer terror and plunging depth. In front, flat as far as the eye can see. We looked at each other and just started laughing uncontrollably. Turns out, it was in fact the long-sought Hwy 570 on the other side of the gorge. We’d made it. It was right where we thought it would be. It was just sheer terror getting there. A few minutes more, and we were back at Ojo; spending, I am sure, more time in the pools to get the knots out of our shoulder muscles. So, like I said, this past Wednesday our plans for the day fell through, and we found ourselves retracing the steps of this journey. Only this time, we started at the top. Knowing that we were in our own car, that we hadn’t died the first time, and that we were eager to make sure this was the place of the original story, we took a trip back down into the canyon. So, I suppose that in both telling you this story, and retracing our steps last Wednesday, we’ve violated the “Keep moving forward. Don’t look back” moral of this story. But after twenty years of marriage, looking back is helpful sometimes. Of course, as Lot’s wife reminds us, you can’t live there every day. But, now and then, it can be good to retrace your steps in reverse, marvel at where you’ve been, and see what you can learn from it. Don’t be afraid of the long road home. Take your time, because you’ll forget why you were in such a hurry anyway. Whatever you do, don’t look down. Wait to take your trip until after GPS has been invented. In twenty years of counseling couples, marrying them –watching some “make it” and some not– I’m left with a feeling something like this: If you knew where the road was going to go, you might not ever take it in the first place. But marriage is more like the climb up a canyon road, rather than the standard metaphor of leaping off the cliff. It is a leap. That one time on that first day. But the rest of the days, it’s a climb that’s sometimes exhilarating, sometimes terrifying, and almost never boring. A lot of terrible stuff is going to happen in even the best marriage. There are a lot of difficult times. For us, there have been tough times that I’m never gonna share here. 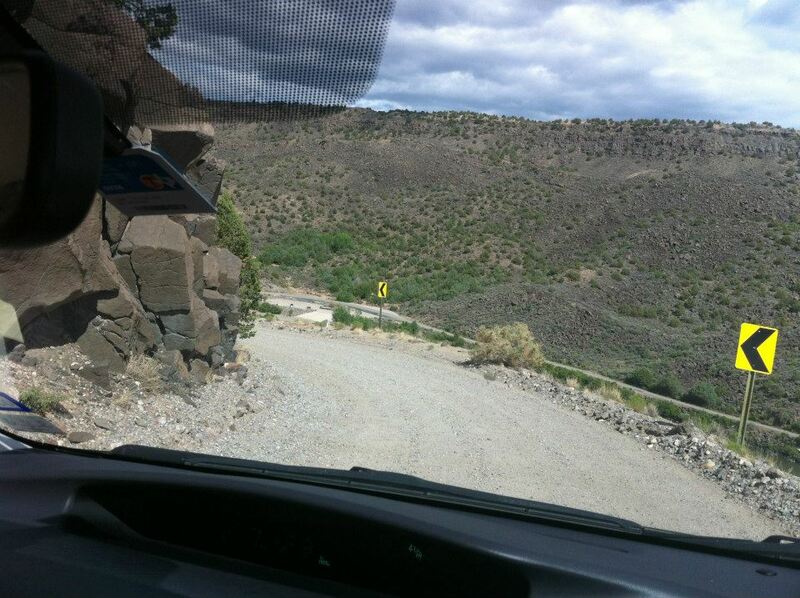 There are switchback roads you fear could send you over the edge at any moment. And all marriages are lived pre-GPS. Even if you start out with a great map, you’re never really sure just where the road is going to end up. A truth of life is that we don’t get to both live it and observe if from the long view at the same time. That’s just the way life works. Nor is there likely to be just one canyon road, either. Sometimes, you get to the top of one ridge only to find it levels out for a while, then starts more stomach-churning zig-zags up again. Does this sound overly harsh? Are you worried about me now? Well, to me? After twenty years in my own marriage, after watching the marriages of many church members, friends, and relatives, it just sounds realistic. Whether any of us admit it or not, it takes a bit of foolishness to start down that marriage road, given just how uncertain life is. It takes a bit of foolishness to keep moving forward, and not look back. But maybe that’s the only way it works out too. And now and then if you’re lucky, you get to the top of an especially high mesa, and fall into laughter at where you have come.